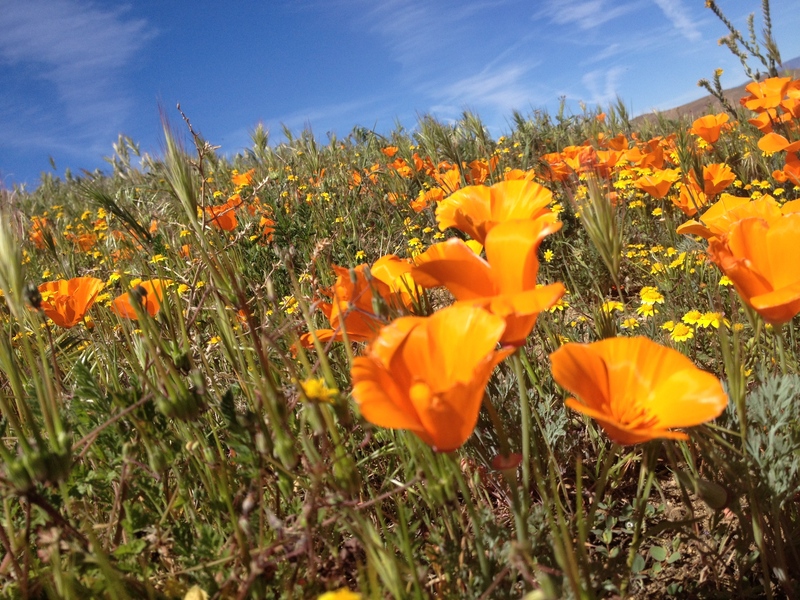 This past Saturday I made a trip with my lady friend up to Antelope Valley Poppy Reserve. Even though the hot, dry sun promised a beating, a nice cool breeze greeted us instead. Thank goodness, because there was not a tree in sight, though there was plenty of fire! Flower fire! They should really have Mario eat a California poppy to get his fireball power. Even though I thoroughly enjoyed the brilliant display, I heard from the park ranger that Mother Nature is much more ostentatious and generous when there’s more rain. 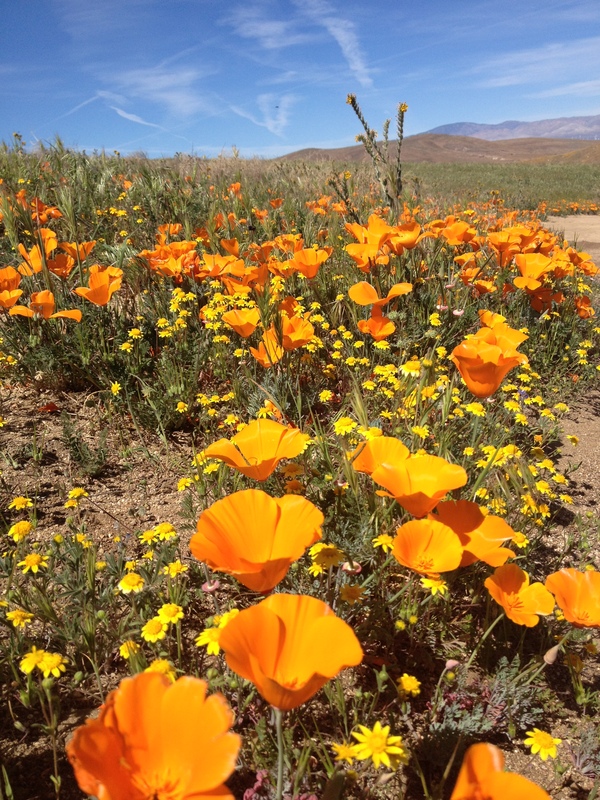 At the visitor’s center, I saw some pictures of the valley’s fields from 2008 – a really rainy year – and the orange-gold poppies covered the field like snow after a blizzard storm. I hope I get to see that some day. If not, I’m happy and content to witness such beauty this past Saturday, especially with such good company. 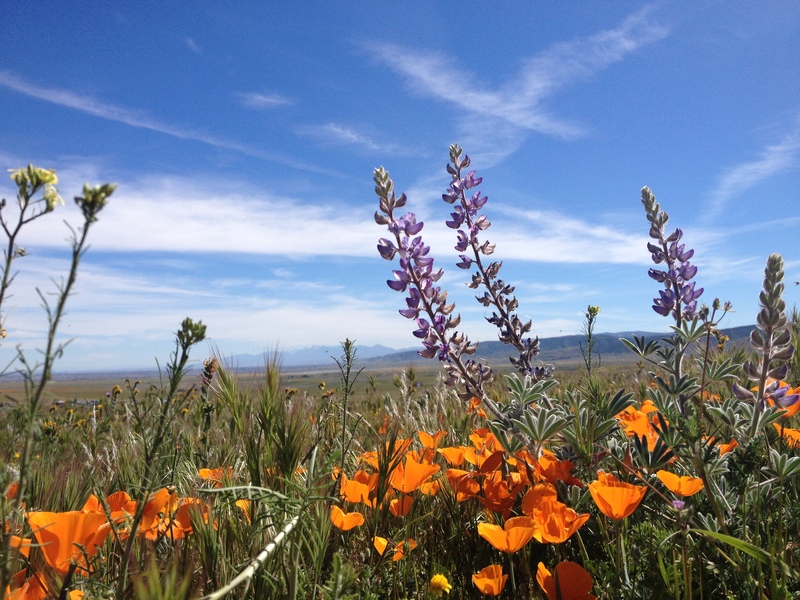 After the trip I really wanted to write a follow-up to Wordsworth’s “daffodils”, and pen my own “Californica”, or “golden poppy”, but then after an hour of trying to trump up some profound thoughts, I realized again how hard it is to write good poetry. It’s one thing to get all the syllables and rhymes to fall in line, but it’s another to convince them ally themselves under a single, noble theme. Then again, Wordsworth’s poem wasn’t that great – in the end, instead of extolling the virtues and wonders of the daffodil, it became a self-referential, delusional paroxysm induced by extreme loneliness. Wordsworth had to get wordy because he was so lonely to the point where he had create some friends out of “crowds” of daffodils. I know that my interpretation of Wordsworth’s poem is unkind and cynical. Anyways, I just wrote the blurb below on a whimsy. I’d brag about the golden poppy fields wherein i’ve rolled. Would St. Peter correct his mistake, then condemn me to fall? I’ve always been curious about the chaparral bush in my front yard with its silky smooth arms, ultra-dense wood and blood crimson bark. 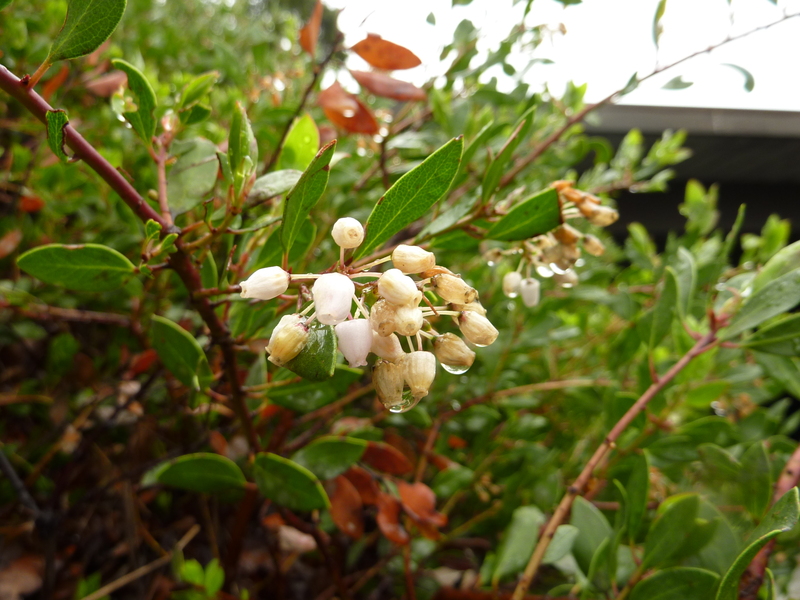 I chanced upon a KQED special on the exact same bush, and it turns out it could possibly be a rare species of arctostaphylos, or in Greek, “bear grapes”. One rare species is so endangered that the government took action to transplant it to a secret location. 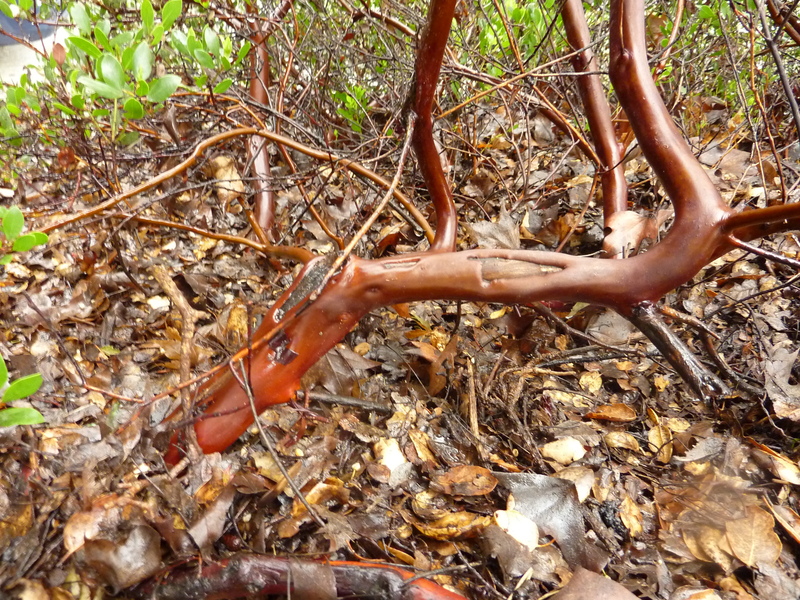 Anyways, the common name for this gorgeous bush is “manzanita”, or “little apple” in Spanish. 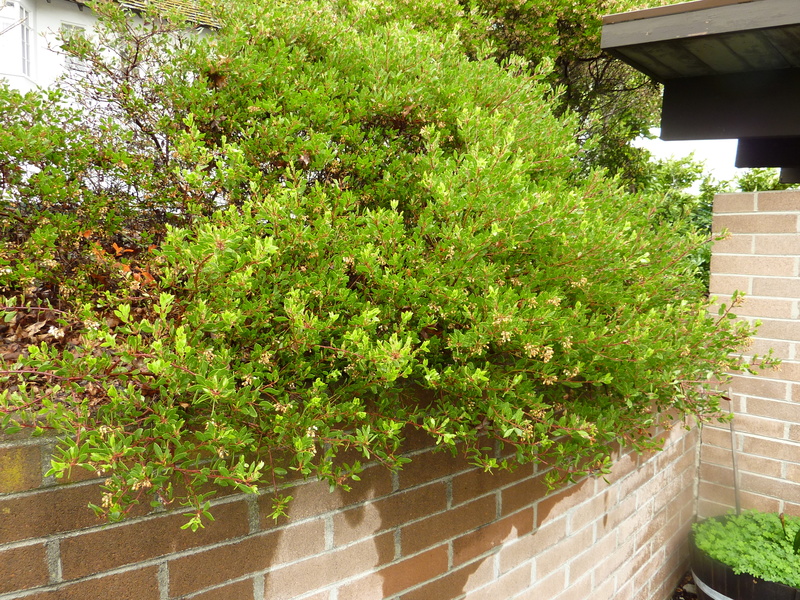 It would be cool to find out that this bush is a rare species. I checked on as many websites as I could, but it was hard for me to differentiate among the many different types. I’ll just pretend that they’re super rare, and enjoy them accordingly ;). Quick question for the readers. When I use quotation marks (” “), I find myself wanting to use single apostrophe marks ( ‘ ‘ ) for some reason. I don’t know why I have this tendency, bad training perhaps, but something tells me there’s a time and place to use these marks ( ‘example’ ) versus (“example”). Any takers? As I rubbed my sore eyes tired from scanning jobs announcements and job advice columns online all day, I knew it was time to take a break. So, I decided to get out and explore our long-forgotten backyard today. When we first moved into our current house we were inspired by the expansive and diverse landscape developed by our industrious predecessors who obviously had a penchant for gardening. 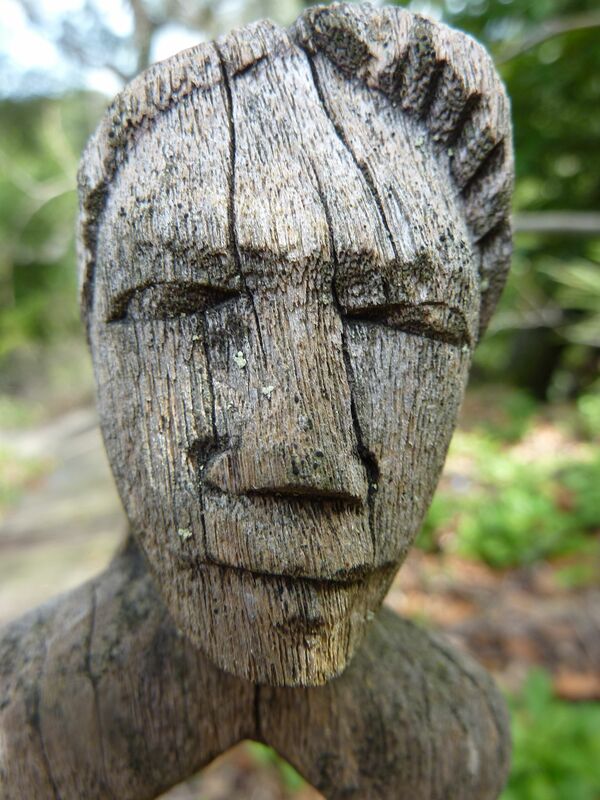 However, not being green thumbs ourselves, we left Nature to fill the void where man had deserted, only cursorily sending a gardener into the bush to maintain some semblance of decency. Later we even stopped sending a gardener, thereby allowing Nature her way. Needless to say, when one lets Nature have her way, the backyard was a mess. Fallen branches of trees laid over crushed paths, dead oak leaves covered the ground, and weeds upon weeds upon weeds were shoving other plant life for space. Plant parts littered the battlefield. Our once tame backyard perniciously grew into a mangy, unnavigable, unmanageable beast. 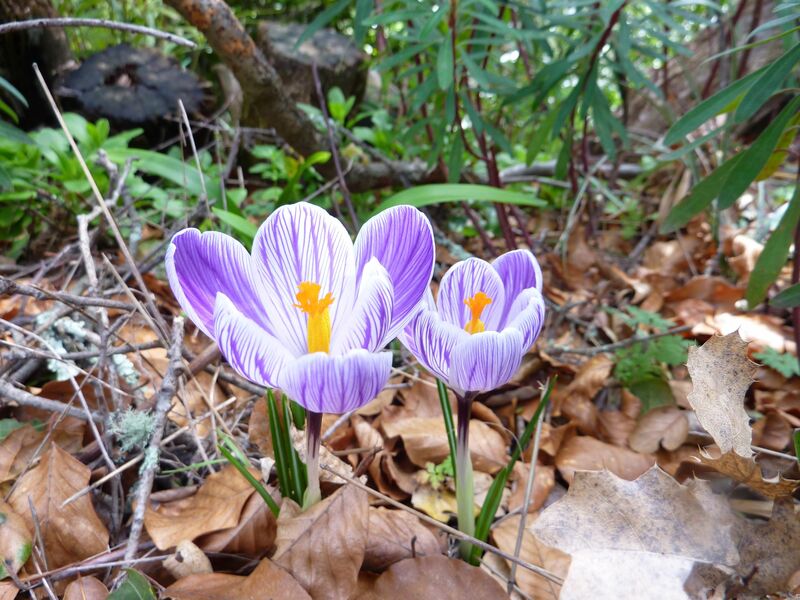 Crocus speciosus I believe (I inquired on a flower forum). 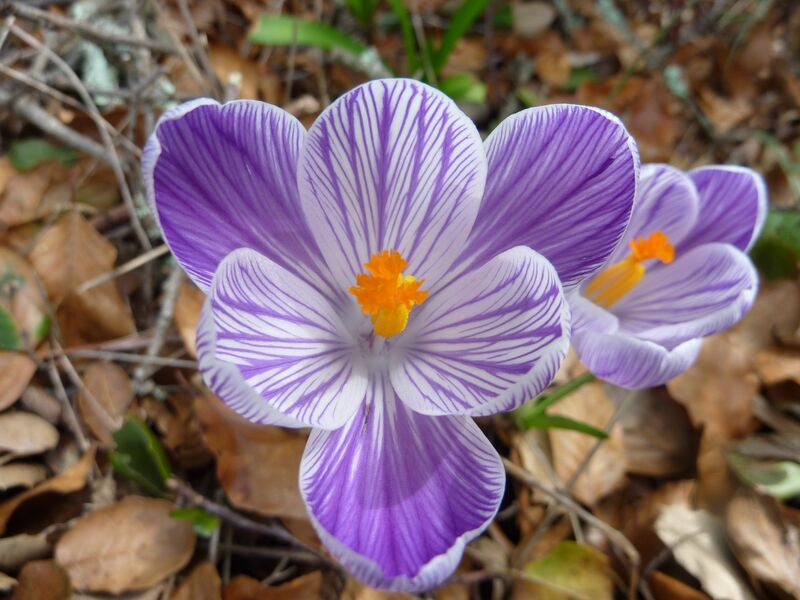 It seems, according to my Wiki research, that this flower is part of the Iris family, and a perennial, which means that it lives for several years. It grows out of corm, or an onion like thing. 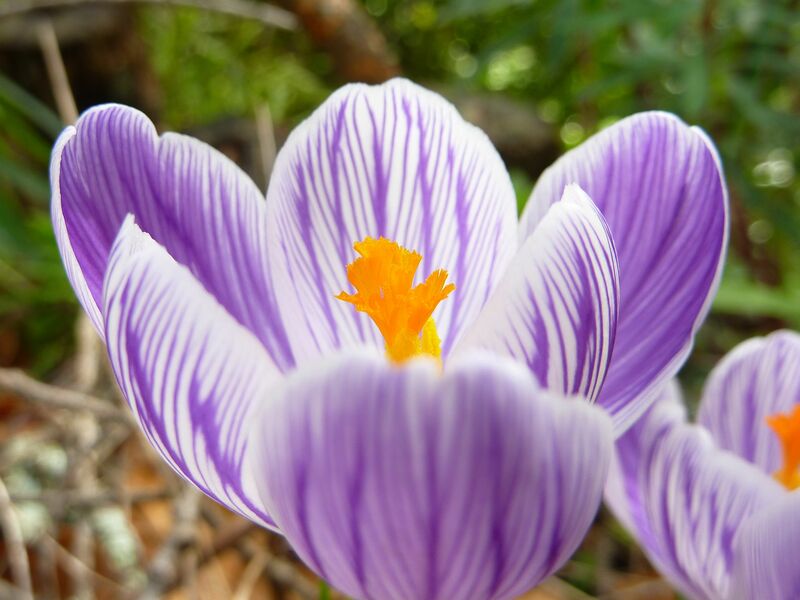 This flower is also mentioned in the Bible. The author compares the bursting of Israel’s joy to the sudden and rapid blossom of this lurid patch of bloom! 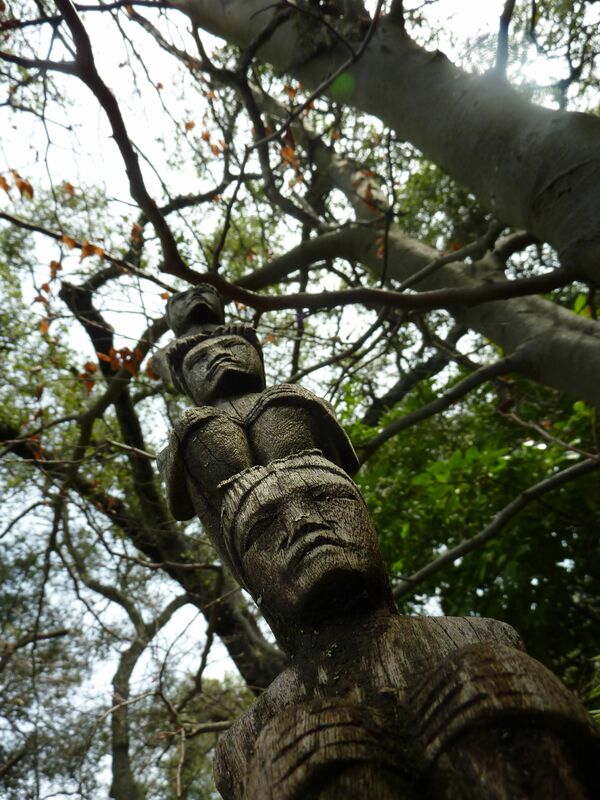 A gargantuan tower of a wooden statue! 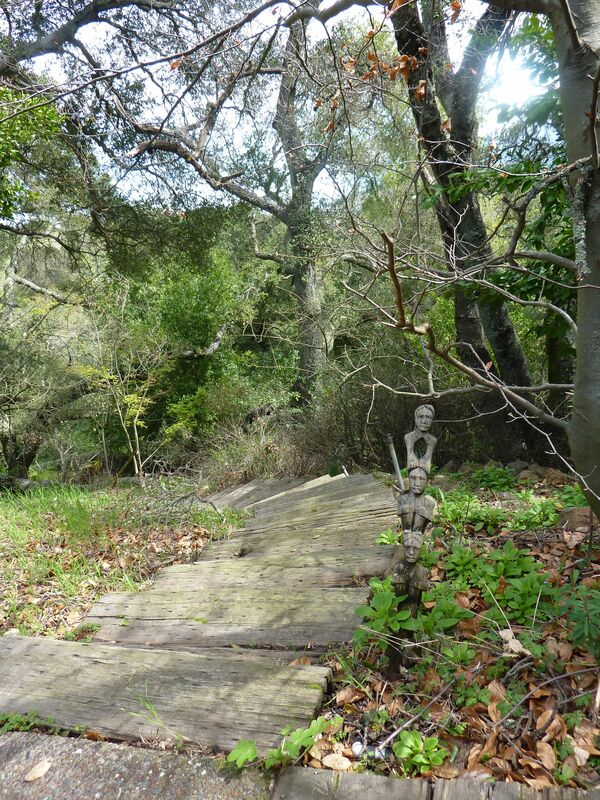 Sometimes it pays to explore the beaten path.